Thinking about serving, serving the Divine, serving others, serving family, serving a meal, being served and encountering a servant. While I was in Morocco this last April, (April of 2014), I met Omar. Omar is my Uncle’s servant. There is no easy way to say that. The word itself is primed and full of meaning. It connotes both positive and negative things for me. My first encounters with servants were in Morocco as a child. My grandparents’ home had three full-time servants; Hassan, Sadia and Fatimah. Sadia and Fatimah did the cooking and the cleaning and my grandfather was tended to by Hassan. I vividly remember being surrounded by these large warm women, who smelled heavenly, unlike anything I’ve ever encountered before or after. The combination was something like sweat, cinnamon, heat, roses, musk and cumin, vanilla and linden flowers. If I could swim in this scent or be near these women again, I don’t think I would ever emerge. I can’t describe it properly, but their smell, their warm arms wrapping around me and carrying me around or chasing me around the kitchen is something I carry with me and which I long for. It is the smell of work, of service, of excellence, of laughter and care and anger and heat and heart and some mystery too. It is the opposite of contained or relaxed or mellow and so very not of this place here. My whole trip back to Morocco has really been a trip back inside of myself and into myself. I find I am reluctant to land fully here in this country, because so much of who I am is actually embedded in where I have been and in these memories, but also in the work of service. It’s a very foreign concept in this country. We don’t have servants, or at least most folks don’t, and unless you are active in a religious community or other non-profit organization “serving” is not always viewed as positive. The idea of being an actual servant to someone is frowned upon and rightly so, for many, many reasons in most work situations. I am not trying to justify servitude to a flawed system, servitude to a wealthy unjust boss or factory here. This kind of service though is not the only kind of service. I see no use in hiding from what is true for me and what I know from my life and my experiences that are the positive side of service. My own service to others is a primal choice on my part in many ways. It is something that gives me tremendous energy and is a kind of tuning or truing. There is a tuning fork in my soul and when I am following the call of the Holy One, the sound inside of me is so pure and so whole and so right that I can’t imagine it being otherwise. That feeling doesn’t always manifest, often if I am asked to be of service or find myself pulled into it, I am not happily singing inside. I can be resentful, tired, frustrated, worried and so many other things, all of which are human and okay for me to be. The difference between those feelings and the feeling of being in tune is an order of magnitude difference. The proper alignment puts me in a groove and there is the touch of the infinite there. I could lift a car off a person, or have a conversation with a star as it is being born somewhere light years away or back here on earth I might find myself helping someone to cross over the river Jordan singing them to their next destination. It’s just not a common experience or a mundane one. I feel blessed and lucky and grateful whenever I find myself there, amazed and renewed, awed and lost and full of tears. It’s the feeling of being a true servant, of serving the Creator and of wanting to do it again and again and to do it well and joyfully and of being so glad I was asked to do it. There is trembling and awe and a deep shaking and rushing to find the core of the task and to rush to do it well. In the Jewish tradition there is a teaching that one should RUSH to do a Mitzvah, not hesitate or stand back, but rush and hurry to do what is being asked. We don’t do this for people we don’t love or beings we don’t revere. If you are in service to a tyrant, you might rush out of fear, but you would never rush out of joy to serve. I’m not serving a tyrant, so my movements are ones of speed and force towards the hope of helping or healing or finding the right words or actions or moment to grow some love in the world. I am so not alone in this. And, I am so very far away from serving humbly and with grace. Which, brings me back to Omar. When we arrived in Oukaimeden, where my Uncle lives, about 9,000 feet high in the Atlas mountains, there was snow on the ground. It is a ski-resort during the winter months and my 86 year old uncle BB still has a ski rental shop there along with his home. This is where Ethan and I came to spend our one night with him. Omar lives downstairs in the small cabin and my uncle lives upstairs. Omar has a wife and two married children in a village about twelve and a half miles away. He rides a large motorcycle and could be anywhere between forty and sixty. I couldn’t tell. He made the fire in the cabin when we first arrived. In Marrakesh we were burning up with heat and the temperature was in the 90s. In Oukaimeden we needed a fire. Omar prepared dinner, he served us dinner and then sat in the kitchen while we ate it, he cleared our plates and did all the cleaning up. He smiled at me, he smiled at Ethan. He speaks no French. I speak only a little Arabic. I said Shukran about fifty times. Shukran is “Thank You.” Omar just smiled. After dinner we prepared for bed. My uncle gave Ethan and I his bed and he slept on the sofa near the fire, something he insisted he did regularly so he would be warm. Omar prepared the sofa and went downstairs. Ethan and I said goodnight to my uncle and climbed into the large and lumpy and cold bed that was graciously given to us. We read a little bit from The Crucible by Arthur Miller and then we tried to go to sleep. There are no street lights in Oukaimeden, most of the homes don’t have electricity. It was VERY dark and very cold and just a little spooky. Ethan got up to use the bathroom which was a tiny room full of dusty, grimy, half-used bottles and looked like most bathrooms I’ve seen that belong to older folks or those who are otherwise-abled and who can’t see or get to the dirt. Ethan came running back into the bedroom and he was hyperventilating. He said that while he was peeing a giant spider the size of half his hand started to drop down from the ceiling towards him in his exposed state. He ran back into the bedroom. Needless to say, I wasn’t too excited when it was time for me to use the bathroom in the middle of the night. There was one tiny light and everything looked creepy. I didn’t want to wake up my uncle so I was trying to be quiet but also doing the Nicole is tapping on the floorboards in a funny way dance. This was my “Spider if you are here, please do not come out, there’s a large person here and it’s better if you stay away” dance shuffle. I’m sure all spiders understand that this particular combination of footwork, shuffling, tapping, scooting, and slight jumping that I was doing is universal code for “do not disturb or emerge.” I tried to use the toilet, but was so terrified of the spider and unsure if my message had been properly translated or received. I made it through the event and quickly rushed back to the bedroom. I didn’t get much sleep, but at least I didn’t need to go into the bathroom until morning again and clearly, along with French and Spanish, I can now add Spider Language to my repertoire. We had a lovely morning walking the area and then got ready to head back to Marrakesh, which was a three hour drive on twisty roads in the old blue 1976 Chevrolet with no air-conditioning being driven by my 86-year-old uncle who told me he needed a new glasses prescription, ummmm, that’s a whole other story. I wanted to buy some ceramics, small things, to bring home and my uncle said Omar would help us negotiate better prices and would accompany us part way down the mountains on our way back to Marrakesh. I was very happy to have the help. We had to drop something off at the only hotel in Oukaimeden and so I was sitting in the car with Ethan waiting. Several men came up to the car with their arms covered in necklaces and jewelery of every kind. I didn’t want to buy anything, so I tried to ignore them, but to no avail. All of a sudden Omar was there, he took off all the jewelry on one man’s arm and he picked through it and handed me ten necklaces. I tried to shake my head no, but Omar would have none of it. No money was exchanged and I couldn’t communicate with any of these men. My uncle came back and I explained what had happened. He told me that this man owed Omar for something and now that debt was partially forgiven. I said, but I didn’t pay Omar and what is Omar getting from this? I asked my uncle if I could give Omar some money, but he said absolutely not and it would insult Omar. I arranged to give my uncle some money and asked him to do something extra for Omar or his family and then we went down the mountain looking for ceramics. Omar stopped us at a roadside hill that had thousands of ceramic tagines and bowls and tiles in piles making up columns and columns and rows and rows of red clay, unpainted bowls stacked on top of each other which were entirely covering the hill leading into the factory. There was a tiny path with small steps through these columns into a large dark building. To my right, once my eyes adjusted, I saw a man who was kneading a large bunch of red brown clay with his feet; stepping in and out of the clay in a large square tub. As my eyes got more comfortable, I saw thousands of bowls and dishes leaning every which way in stacks of tens and twenties and more. It was a jumble of sizes, shapes and colors. I walked through trying to find something small I could safely pack in my bag and bring home. I found some beautiful white and blue bowls with a thin strip of silver lining on the bottoms and around the lip of each bowl. I asked the merchant the price and he said they were the most expensive ones and quoted me a price I didn’t want to pay. At that point I noticed some others that I also liked and they were smaller and didn’t have the silver. He told me those were made in this factory here, unlike the others I had previously selected. He quoted me a price and Omar nodded and I paid him. On our way back to the car, Omar handed me the two other bowls, the expensive ones. He had bought them for me without my noticing. I couldn’t understand. I asked my uncle why and he told me Omar said I was family and he wanted me to have them and to have joy and that it made him happy to think of me with them. This man, who I only just met, was rushing to do something for me. He owns no home, he has worked for over twenty years or perhaps thirty for my Uncle, and he couldn’t stop trying to serve me, to offer to me. I didn’t and don’t know how to properly thank him. His gift was coming straight from his heart. He had the largest grin on his face, so happy with himself. This generosity and desire to please was radiating off of him. I told my uncle to thank him and tell him that I was so happy with the gift and that I would treasure these bowls and think of Omar always when I used them in my home in California. I gave my uncle some more dirhams and asked him to pass them on however and whenever he could as he saw fit for Omar or his family. Even if I hadn’t had a penny to give, Omar would have been and done exactly as he did. He wanted to make me happy, he wanted me to smile, he wanted me to be served and he wanted to do the serving. He served me. He is serving me still, because I can’t get him out of my mind or heart. His simple kindness, his generosity, his humility, his smile, his strength. All these qualities and more dance around in me and beg me to pay attention. Serving with joy, serving with kindness and with no thought of reward, serving out of a sense that the person before us is family or Holy or just deserving, this is the service I want to embody. How am I family to Omar? I am family to him because we are all family. 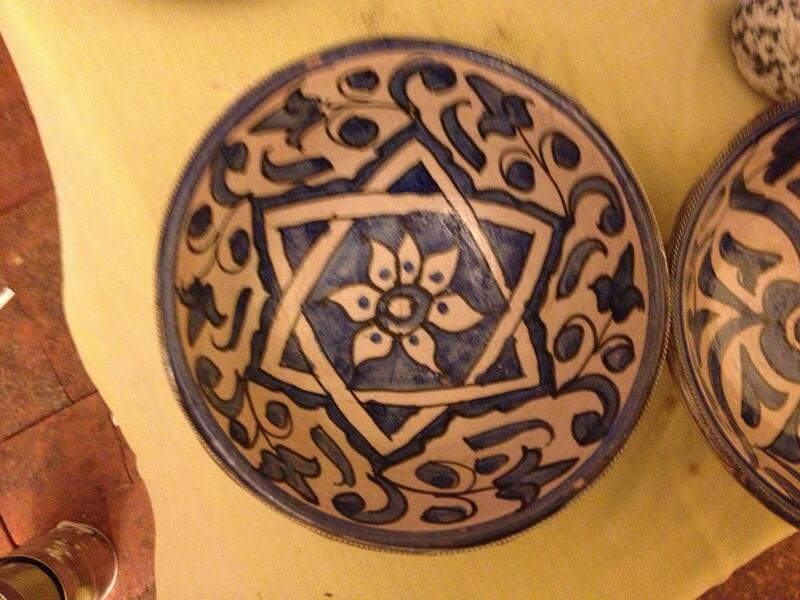 My Omar bowls have a special place in my home and every time I see them or use them, Omar is with me. The jewels he gave me also connect me to the Moroccan soil, they come from the red earth and the mountain caves of the African continent, the birthplace of humanity. When I wear them, I feel myself connecting back to the Atlas mountains and to an ancient reality, to a warmth and strength and beauty and even to the large, prehistorically large spiders that come down in the night. Let me introduce to you my friend Steve Smith. Steve and I met at Holy Hill Hermitage in Skreen, County Sligo, Ireland when we were both on retreat there. Steve and his wife were there for two months. I was there for nine. You can read all about my adventures in Ireland, if you haven’t already, right here, under the Jubilee tab. Steve was working on his novel called, The Twin, which is historical fiction about Jesus and his brother Thomas, who Steve has conjured and who is very much real. Steve’s story is an accurate historical portrayal of life in Israel/Palestine around the years when Jesus walked the earth. His story is about the entire family and their hard lives as Jews under the oppressors of the Roman Empire. All the characters that folks know from their bibles are here, but they are having lives, just like we do, and those lives are colored by terrible horror, acts of barbarity, beauty and complexity. Steve consulted with me, which was a happy circumstance for us both, about all things Jewish. Steve is a retired priest, he knows his stuff Christian and Jewish, Buddhist and Hindu. Nevertheless, he isn’t Jewish. Part of his story is about the Divine Feminine and both of his Marys, the mother of Jesus, and Mary Magdalene are women of power and are channels for the Shechinah. Steve is already in touch with the Shechinah. Shechinah gets mistranslated and mispronounced all the time. Trying to name the Divine, is just not really possible. All we can do is list the attributes, describe the qualities. Shechinah is not the name of the female part of the Divine. Shechinah is much, much more than that and not containable within any boundaries. She is called the “In-Dwelling Presence” most often. In the Hebrew, when there is a reference to the cloud that protected the Jewish people as they journeyed in the desert for forty years, that cloud is referenced as the Shechinah’s Presence. She is the protector and the lover and the gentle, tender, green-earth growing mothering aspects of the Divine. Whenever the Divine is being referenced as merciful, the word used comes from the root for the word womb/rechem. This word becomes the word Rachamim. A more accurate translation for this Hebrew to English would be Womb-Like One. Imagine if when you read the bible, instead of “Merciful God” which is how it gets translated, it actually said “Womb-Like One.” I always try to get folks to understand this basic concept. There is no word for god in the Torah (see Why Ha-Shem Not Naming the Divine). There are only attributes of Holiness that are used interchangeably based on what is going on and what is needed. When those qualities are feminine, which many of them are, female gendered language is used, verb tenses etc… When those attributes are masculine, male gendered language is used. Obviously, the Divine does not have a gender, nor are the words masculine and feminine very useful to try and understand the fluidity of gender that exists in the actual Torah when read in the original Hebrew. Access and understanding of the sacred texts in their original language is crucial, but it is something few of us can do. Since having feminine references to GOD THE FATHER was not okay, back in the day, when all of this was translated to Latin, Greek, German and eventually English, we have the mess we have now.The Divine is all and more. The Shechinah is part of that all and more. My connection with Steve happened in Ireland, where we studied her works and who she might have been in the lives of the Virgin Mary and Mary Magdalene. I invite you to read his book, if you are interested in a great story that many folks think they know, but the way Steve tells it, is something all together more. The link for his book will be at the end of this post. With no further ado, I am greatly honored to include this Dia de Los Muertos travel-narrative story by my friend Steve. Unlike his book, this post is not about Jesus as a child, but about being saved when you are lost and alone and finding that you are indeed held in a womb-like way, even when you think you are alone. After settling in to our new life in Mid-Coast Maine, Jeannette and I have just embarked on another ex-pat adventure. Jeannette is in Barcelona, Spain, where she has been invited to team teach an extended workshop in Internal Family Systems to a mostly Spanish-speaking audience. She will be participating in this workshop in November, January, and March. This week, I left for Mexico, and am staying first in a small mountain town, Jalpan de Serra in the Sierra Gorda, in an exquisite ecological zone five hours north of Mexico City. Jeannette will be joining me for a seven week stay in San Miguel de Allende, followed by a week in the Yucatan, before she heads back to Spain. I will be travelling to Peru in January, where good friend, Michael Corrigan will join me to experience Cuzco, Macchu Pichu, and Lima. Then I will meet up with Martin in Chile, and travel to Patagonia for some trekking, before visiting Argentina. While we are away, Colleen and Luke are taking up residence at our house-sit Seacroft, our wonderful home, by the Penobscot Bay. It was a crash landing arriving in Mexico a couple of nights ago. I picked up my rental car in Mexico City, and, foolhardily perhaps, tried to rely on my long since atrophied cab driver skills to negotiate my way out of one of the largest cities on the planet. That painfully accomplished, I started out my journey to Jalpan, which Google Maps had identified and directed me to north and east of Mexico City. Even then, I managed to fritter away my time getting lost, and as darkness set in, I found myself on deeply pothole pocked roads, doing untold damage to my front tires and rims. Finally, my left right front tire blew, and I coaxed the car into a Pemex station, and got out the spare, which, predictably, was bald. Into the night, I pressed on, now sleep deprived and disoriented heading up into the switchbacks of the montañas. Suddenly, my right tire blew, and I had no breakdown lane or place to park the car. For at least a few miles, I drove the car on its rim, hoping against hope for somewhere to pull out. Finally, a small opening appeared in the darkness, but still, I was not out of harm’s way. Ongoing trucks bore down on me, blaring horns and high beams alight. For a moment, I had a strong premonition, with no dramatic exaggeration intended, of my death, brought on, no doubt, by an overwhelming sense that I was completely lost and vulnerable, that brought on, no doubt, by my complete stupidity and arrogance in assuming I could bivouac my way through this uncharted territory. Despair is a funny thing. It eviscerates, but it also provides for some detachment. I raised the hood, put on the hazard blinkers, opened the trunk, and stood in the darkness, facing the oncoming lights and blare of horns. In that timeless place, I thought it would be hours, if at all, before rescue would come. And at that very moment, a truck approached and turned on its blinking lights. My loved ones must have been praying at that moment. I sure was. It was a wrecker. Out appeared a young man, Mitch he introduced himself, and we began the task of communicating what had happened to my rental. My Spanish is rusty in my good moments, but without sleep and stressed, it’s a jumbled mess. After several fits and starts, and appeals to my Google map, and showing him by the light of his cellphone the damage I had done to both rims, he cheerily urged me into the cab, while he waved off traffic, and hoisted the car on to truck’s bed. Ten miles further, he brought me to his hometown, Huauchinago, and pulled into his workplace, where his compañeros, taking good-hearted delight in this gringo’s predicament, set to pounding out the sorry tire rims with mallets. Everyone has damaged rims in Mexico, they said. One pantomimed a giant boom to show how the cars fell into the ubiquitous potholes. Then, my host in Jalpan, who I had texted earlier on Mitch’s cellphone in the car, rang. I explained how close I was, and I was on my way, after I weathered this interruption. “Huauchinago”?, he asked, “I don’t know this town.” It seems, with help from Google, I had found another Jalpan in the opposite direction, and was now eight hours off course. Now, hearing Mitch explain things, the compañeros were doubled over. Then, Mitch set to getting this pilgrim to a hotel in town, while they set out to repairing my car. The night was ablaze with the fireworks of the great feria, La Dia de Los Muertos. When we arrived in town, skeletal apparitions appeared, all reveling in this festival, where the dead come out to party with the living. Reflexively, I joined in the dance. Next morning, Mitch brought me back to the car, and demonstratively showed me how bad all the tires of the car the rental agency had given me, so we set out to a roadside tire shop. There, two cousins, named in Spanish “The Mosquito Bros”, changed out all my tires on my repaired to normal rims, and found new tires with enough tread to get me safely on my way. Mitch wanted to take pics, and get ourselves set on Facebook as friends. He told me about his four-month old daughter and four-year old son. He said, as best I could understand him, my detour had led me to Huauchinago, so we could become friends. Amigo Mitch, fixing Steve’s tires. Sandwiched between times and trips to take care of my father, I had the tremendous honor and privilege of officiating at the wedding of one of my God-daughters. I’ve only done this a few other times. It’s a very intense thing to be the person spiritually responsible in a setting like this. The folks getting married are the important ones and honoring their needs and wishes takes a fair amount of time, insight, and emotional and spiritual presence of mind. I was quite anxious about whether I would be able to pull it off. In addition to my fears about doing something wrong or looking bad, in comparison to the absolutely gorgeous bride and groom, holding this kind of energy and being the person who represents the energy of Holiness is a calling I take very seriously. We all carry Holiness and no one is more or less Divine. Not everyone recognizes this and when you are the designated driver for any event that is a Life-Cycle, one like a wedding or a funeral, it takes preparation, incredible control, no small amount of guts and some kind of crazy. I’m pretty good at most of these, but the incredible control part is something I have to really work at. So, I asked my husband to help me monitor certain behaviors of mine that I didn’t want to bring to the fore. This meant I needed to be extremely sober and to make sure I didn’t drink more than two glasses of wine at any of the events. I was on duty and having a relaxing fun time was not what this wedding was about for me. Did I mention the wedding was at a vineyard? Did I mention that I love good wine? Did I mention that I’ve been working extremely hard emotionally, physically and spiritually to navigate the territory of my father’s health, the death of my belle-mère and spending about five minutes with my husband in the last six months? Oh well, wine is just some grapes that have fermented, NOT! It went really well, better than I could have expected. I managed to do what I wanted to do and to serve the bride, groom and their families. I had a good time once all the pieces I was responsible for were executed properly. Folks were generous in their praise of my service. That felt really good and validated that my preparation and presence of mind, heart, body and spirit were in attunement. I always and only want to be the vessel for the Divine. This means clearing out my ego and my version of what is supposed to happen. This can be a little dangerous. I can’t get so plugged into the flow of Holiness that I’m tripping out (this happens for me a great deal of the time). It’s a balance of walking with what is at hand, holding my heart and hands out and up to Heaven and asking for the Shefa/Sweet Holy flow of energy to dance into my words and actions. It means grounding myself deeply into our Holy Mother Earth and feeling the pulse of the planet. Feeling the pulse of the planet! Tuning into the pulse of the planet is not any kind of walk in the park ever, but especially right now, it’s a truly earth-shattering time. At this particular moment, in our collective history, Our Mother is speaking a very specific kind of language. She’s amplifying the message and giving us hurricanes, fires (I normally live in Northern California which has been on fire and smokey for weeks), earthquakes and flooding. Our planet is not just talking right now, she’s keening and wailing and doing everything she can to help us wake up and correct our behaviors. In Elul, we blow the Shofar to crack open our hearts to literally break through the carapace-like hard shell we call Klippot that has covered up our tenderness and our heart. It’s the most ancient warning device, call to battle, earthquake alert system. It’s piercing, you cannot ignore it, it cuts through all illusions and it’s loud. I saw a very powerful piece of footage from Mexico City during the earthquake there. It was late in the night, because I was unable to sleep. Often, this is because, I am attuning to the planet when I’m not attending to someone. It’s just not easy to sleep when there are hurricanes and earthquakes and folks all suffering as a result. My prayer practice is about feeling the hurt and crying and breaking open more and more. It’s about asking the angels to go, to go quickly to anyone in need. It’s about just using every possible strategy I can think of to help ease the suffering on this planet. In the footage, a man from the news was reporting on some sports event when all of a sudden this piercing and very different kind of siren started blaring. He was calm and explained, in Spanish, that this was their early warning system, that an earthquake was immanent. As the footage continued things got more shaky and eventually he got up from his seat and instructed folks to get to safety and the camera crew went to the window with him and looked out on the city. This was, of course, not a safe place to be, but these were news reporters. It was night and you could see the shaking from the camera movements and the lights of Mexico City went out in huge swaths. It was terrifying and impressive and amazing and horrifying and the sound of the electronic shofar was blaring for the whole time. So, this is the time we are living in and it’s a privilege to be alive. We get to have opportunities to serve those in need and to work on mending what is broken. It’s not a task, or a burden. It’s a calling and a hunger that comes from our collective shared body, the body human, the planet body and our shared common heart, split and shattered into 9 billion people, but still all part of the same organ. And, we’ve been in worse situations. I mean a few billion years ago, when the stuff of creation was zooming around our universe somewhere, in our relative spatial neighborhood, one large something hit this planet and almost broke it in half. Luckily for us, that huge hit generated a big chunk that became our moon. We weren’t in human bodies, at that time, but talk about seriously intense climate change. This was the mother of all events for our planet. Mammoth, magnificent and tremendously destructive forces have always been part of the story of this universe. It might feel like we aren’t spinning around an axis in an orbit around the sun in our galaxy, which is a tiny grain of sand in the Holy One’s hand full of billions of other grains of sand, but we are indeed doing just that. Joni sings this better than I could ever say it. It’s as true now as it was then. What is our duty, our obligation, our responsibility at this time of tumult and disaster? The “same as it’s ever been, same as it ever was.” It’s our job to do the work, to take care of each other, to take care of the planet, to pursue justice, to love with hurricane force winds, to storm surge the forces of violence, injustice and cruelty and to eliminate them with acts of loving kindness and imagination and art so deep and so connective that all that’s left of the landscape of hate is some tiny debris that is no longer toxic. This is also the work of Elul, the month in our Jewish calendar when we really examine ourselves and our actions and we make amends and corrections. The time is now and the urgency of our collective engagement, across all the false divides that separate us or make us think we are anything other than one being sharing one heart, cannot be emphasized enough. And, believe it or not, it’s really not that hard. It’s exhausting to do this work and it’s humbling, in an often devastating way, but it isn’t across the ocean or in the heavens, it’s in our hearts and our mouths and we can do it. None of us wants to see our ugly sides, our broken parts, our lack of generosity, our lack of calm, our indifference, our resistance to what we know needs to be done. None of us like being informed that we’ve messed up, missed the mark. None of us wants to learn that we failed to protect those we love or that we are addicted or that we’ve hurt another person or the planet just by being alive and human and a person who is fallible. Nevertheless, it’s a very simple turning; T’shuvah (to return/to turn/to pirouette) that can make all the difference. When we turn, the rabbis say, the Holy One and all the forces of goodness and all the Angels rush, they rush, like a blast of strong wind to push us and assist us and to help us in our work. So, all we have to do is turn/return. On that note, I’ll end with a very powerful and personal moment of profound healing and mending a true Tikkun from the memorial for my belle-mère, Judy Barchilon, May her memory be for a Blessing. My mother Helen Redman and I haven’t been able to engage with each other very much since I’ve been on back and forth duty between California and Colorado. My carbon footprint has been huge, in order to be present for my family. This means that, eco-groovy, organic-only, always trying to use my own bags and water bottle me is actually a big part of the link of the problem in the climate change chain. I am as responsible for climate degradation as someone who actively pollutes or dumps toxins into a watershed. My actual carbon footprint is very large. I’ve traveled between my current home and my former home, by air, more times than I can count since March of this year. Doing so has been the only way I could be part of taking care of my father, my brother, and my heart, and it’s a mitzvah /commandment/obligation/Holy request that I have no problem doing. Honoring my mother and my father is not optional or problematic. It’s work, but it’s like breathing, I cannot fathom doing anything differently. On the other hand, doing so in the way I am means that I’m contributing to the very problem I’m trying to help eliminate. Arrrgggh it’s so hard being human! So, to honor my mother, I asked if her if she could re-arrange her travel to Boulder to overlap with my current stay with my father. In this way, we could see one another and I could connect with and love on, and be loved by her. She also felt a call to come to the memorial for Judy and to support my brother and I. She asked me to ask my father if he would be okay with her coming and he said “of-course.” This is really all due to Judy. I’m not going to go into the history here. You can read my beau-père Kenny Weissberg‘s book Off My Rocker, for one version of the story. My parents separated when I was seven years old and it’s been a long and very painful journey for me and for my father and my mother and brother also. A lot of time and therapy have been involved, on my end. Their divorce also brought and brings profound gifts, like my belle-mère Judy and my beau-père Kenny. My mother and Kenny have now been together for 46 years. They just celebrated their anniversary at the end of July. I hate the word step-anything. My relationship is a step different with Kenny than it is with my biological father, but Kenny Weissberg is and has been an amazing father to me and grandfather to my children. He’s every bit as much my family as my biological father is. Judy, also, while not as close or long a relationship was had with her was family. She made my father whole and for that she will always be beloved by me. This is why I prefer the French terms, which mean handsome-father and beautiful-mother, instead of step-father or step-mother. So, my mother came to the memorial for her ex-husband’s wife. At the end of the evening, which was incredible, I noticed my mother and father talking and I could see the care and love flowing between them. This was something I have not ever witnessed. I was six years old and truly have zero actual memory of them being together. Somewhere, in my cells, I remember, but I don’t have any memories of my parents together. There are lots of photos, but the memories are not there. So, this was and continues to be a ripple of healing, goodness and love for me and for them and for my brother and my children and all those who are connected to any of us. The beauty of any and all tikkuns/healings/mendings is that they are not of this world, or time alone. They transcend time, and space. They transform the past, present and future. A true Tikkun is a movement in time, dropped into the river of Light of the Divine, which accesses the flow of Shefa into all places of wounding, it can literally change everything. May you trust that the gates of Heaven are truly open and that the flow of Divine Love is strong and continuous and there for you, so much so, that you can take the risk of doing what is most hard for you to do, of being brave and facing what needs facing and making the corrections and changes that need making so that there is more good going into our world than brokenness. L’Shana Tova u Metuka/A Good and Sweet New Year to you, and Big, Big, Big Mama Nicole Love to all of you reading this and all of you who are part of my support system of likes, loves, emails, and prayer, as well as all the health practitioners who work with me and on me to keep this body of mine moving through space and time so I can take care of those I love. You are part of why I am who I am and can do what I do so thank you! My mother Helen Redman and my father Jacques Barchilon taking care of each other at the memorial for Judy Barchilon, Wow, wow, wow!